The conflicts between people of color and the criminal justice system is no secret. This has been an ongoing problem in America for centuries and sadly it never seems to stop. Throughout history people of color have had to suffer at the hands of the criminal justice system which time and time again has led to up risings in society such as the Civil War, the Civil Rights Movement and still seen today with the Black Lives Matter movement. A prime example of this never ending problem took place on July 17th 2014 when Eric Garner was brutally detained by police officers resulting in his death. On this tragic day, the 43-year-old was in Staten island where he allegedly sold illegal untaxed cigarettes. Garner was no stranger to the police force in the area having had prior encounters. Yet, on July 17th a police officer who had encountered Garner once before had been accompanied by a new partner Daniel Pantaleo who would be the one to later cause the death of Eric Garner. As they approached him, Garner had proclaimed that he had not done anything. He kept insisting that he was just sitting there after supposedly breaking up a fight which had occurred before. The police officers continued to instigate him for the reason being they had seen him sell these cigarettes. The argument had gone on for several minutes, when both police officers to took out their hand cuffs and proceeded to arrest him. Garner began to retrieve his arms asking the police officers not to touch him. In that moment, officer Daniel Pantaleo had placed his arms on Garner and proceeded to put him in a chokehold; an action that is prohibited in the New York State Police Department. He wrestled him to the ground remaining in a chokehold until he was placed in handcuffs. It was at this point the officer held his head against the pavement all the while he was yelling “I can’t breathe.” He had repeated the statement about 11 times which received no attention. He had been left on the ground unresponsive. No one took that action to give him CPR because he appeared to still be breathing. Garner was later pronounced dead due to severe neck and chest compressions. Two days after the fatal encounter officer Pantaleo was put on desk duty and was stripped of his gun and badge. With all this being captured on video by a bystander the police officer was taken to court and the entire incident was put under investigation. Upon investigating the police officer’s history, it was brought to light that there were multiple charges of disciplinary complaints and individual allegations against him. Upon speaking to the jury, he stated he did not mean to put Garner in a chokehold and that he was attempting a different form of restraint. A day later the grand jury gave its decision not to indict officer Daniel Pantaleo, due to the lack of evidence. In my personal opinion I felt the police officer should have been charged and held accountable for Mr. Garners death. Although there wasn’t much evidence, it was a clear use of excessive force on the unarmed man. The officer had utilized a prohibited form of action being the chokehold. It’s clear to see this never ending problem people of color, specifically black people, will always have to face in life. They will always be persecuted by the criminal justice system as they have been for centuries and it seems that no matter how loud the people speak and make themselves heard there seems to be nothing done in response to it which is the biggest crime of all. Sadly, this incident took place only a week after the officer involved in the Michael Brown shooting was not indicted. 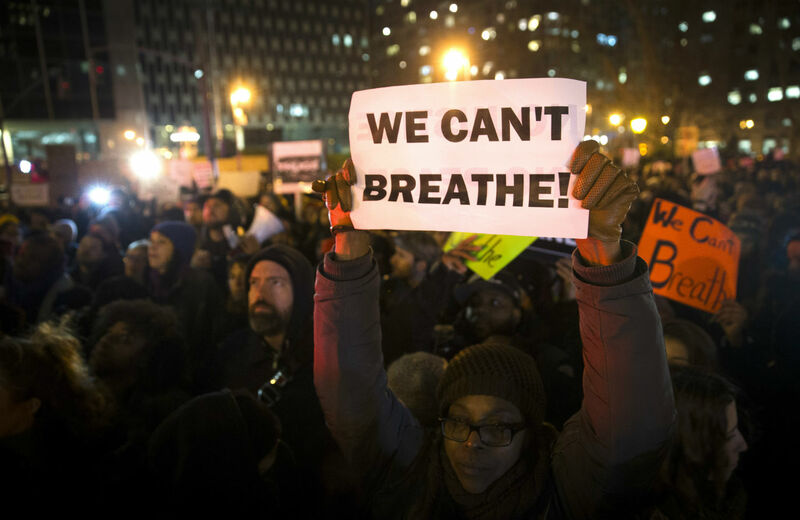 This triggered an up roar in the black lives matter movement where thousands of people took to the streets reciting Garners last words “I can’t breathe”. It is just sad to see how our criminal justice system has just completely failed us. I think it is unbelievable to see how a police officer in most cases goes unpunished and does not serve any sentence, especially when a lost of a life has taken place. But then you see people getting mandatory sentences for drug involvement, or life sentences. Just by looking at that simple fact you can just see how backwards the criminal justice system is. Garner’s death was a clearly a result of failed broken windows policing. He was essentially handled aggressively after selling illegal cigarettes, a minor offense. Although the rationale behind this type of policing focuses on cracking down on particular behaviors, it is clearly targeting specific people, blacks and Latinos to be exact. Quite often, when police officers give commands to “suspects” in their encounters, they expect them to obey them immediately without considering any initial emotional response they may have in reply to being considered a target. I believe Garner’s decision to resist being arrested was a natural response upon being awkwardly bombarded by the police. If he had been given a few moments to gather himself, the entire situation wouldn’t have potentially played out the way it did. The police should concentrate their efforts on more serious crime and get rid of broken windows policing entirely. This class really opened my eyes on the full implications of what happened to Eric Garner. While i knew it was incredibly unjust and the officer in question should’ve been indicted (in my view anyway), this class helped me to understand that it was a result of a failed Broken Windows policy (as Raiaan pointed out). Situations like these really bring into question the usefulness of this Broken Windows type policing (I don’t think it is particularly useful) and how much it is used to target minorities. The stop and frisk initiative, which is known for being probably the most racially charged initiative by the NYPD, seems to come under this umbrella of Broken Windows. It should be stopped. I agree with the points made by Raiaan and Shevin. Failed broken window policing is not helping our society at all. Instead, it is creating a bigger gap between people. When we have so many that are corrupt at the center of justice, cases like this happen more often than we expect. These policies are clearly used to target minorities and it’s actually sickening to think about how some people are okay with it. As a nation we need to get rid of these policies and focus on going after actual criminals that commit major crimes, not targeting minorities committing minor offenses. I saw the recording of Eric Garner’s Death and it still brings great sadness into my heart. After the Trayvon Martin and Michael Brown cases its as if it was a free pass for officers and the justice system to go ahead and start using excessive force on people. Its as if they are using the strategy of fear to control people, much like Hitler. It makes sense because the foundation of the of the Broken Windows Theory is all about instilling fear into the society until we are left feeling hopeless and disconnected. The problem with this theory is that eventually people come to realization of their fears in order to band together and fight back. The best example of that would be the Ferguson riots. To start something like that wouldn’t be a wise choice because if rioting begins, the city will most likely be torn apart. The broken windows policy needs to stop in order for our society to trust police officers again. If the men and women who are suppose to “serve and protect” us are the one’s instilling fear than we have no one but each other to trust and from that it will eventually lead to rioting or even worse a civil war. It’s crazy to think that a police officer who had multiple complaints against him recieves no discipline while Eric Garner has had run ins with police and his final encounter ended in death. This shows that police officers themselves are put above the law they are supposed to protect. It also shows how unfair the justice system is in regards to who it really protects. Authority figures are held on a pedistule while citizens, especially minorities are scrutinized for the smallest infractions. From my point of view, this is crazy from either side of the coin the police officers by just having a badge and being invulnerable to the law itself and citizens regardless their skin color into thinking they can just contradict an officer. If a police officer tells you something you do it you don’t put resistance if you are innocent you have nothing to fear but also police officers should be check constantly especially one with disciplinary issues they are probably going through some mental breakdown and are not suitable to do the job properly should be taken out of the duty until things get better.